The American Dairy Goat Association welcomes your participation in the 2019 Goat Milk Products Competition. The competition will be held at the ADGA Annual Convention in Boise, Idaho in October 2019. This competition will be open to all cheese makers, commercial and amateur. Cheeses will be judged by cheesemonger, Gordon Edger of California and professional food designer, Sarah Masoni of Oregon. ADGA will award rosettes and $200 & $100 gift certificates to the Best in Show and Reserve Best in Show in both the Commercial and Amateur Divisions. Ribbons will be awarded to 1st – 3rd place winners in each division. 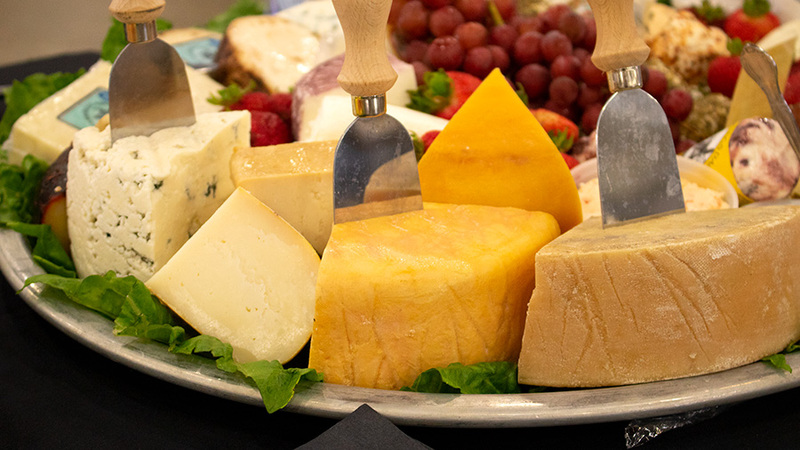 Commercial cheeses will be showcased at the Goat Products Reception. Both Convention attendees and the area public will attend this event. Since this event is intended as a promotion for goat’s milk and specialty cheeses, we encourage commercial producers to include promotional materials and distributor information along with entries. These promotional materials will be withheld during judging and placed with cheeses at the Products Reception. Best in Show and Reserved Best in Show cheeses/products will be auctioned during the reception. Only 100% Goat’s milk product is eligible to compete in this competition. Goat’s milk and curd used in the cheese/product must be of USA, CANADIAN or MEXICO origins only. Please fill out one entry form for each cheese or product entered. Amateur products will not be served at the Goat Products Reception. A cheese maker will be considered commercial if they have been legally selling their product for a minimum of six months at the time of entry. Please send promotional material or placards in the shipping container(s) along with your product. (Commercial entries only). PLEASE DO YOUR ENTRIES ONLINE USING GOOGLE DOCS, https://goo.gl/forms/fksR5d7nNNLDoUSE3. PLEASE PAY ADGA DIRECTLY BY ADDING ENTRY FEES TO YOUR ACCOUNT. IF YOU ARE NOT AN ADGA MEMBER AN ACCOUNT WILL BE CREATED FOR YOU ON THE ADGA.ORG SITE. NO OTHER FORM OF PAYMENT WILL BE ACCEPTED. For more information on the Goat Milk Products Competition, contact Karyl at bodyshops14@gmail.com or 507-894-4274. ENTRIES WILL NOT BE PROCESSED UNTIL PAYMENT HAS BEEN MADE. will be sent to you. Place one of these labels on each of the products that you are entering in the contest before shipping them. Commercial Soft Cheese/Yogurt/Kefir/Butter/Confections-Please send three packages of soft cheeses or product in the form in which it is commercially sold. For example, three logs, three pyramids, or three jars. One will be labeled for competition and the other two will be displayed at the products reception. Any entry containing less than required amount of product will be disqualified. Amateurs entering product or cheese need to send only one item per entry and these should be labeled with printed competition labels. Entries’ shipments must be timed to arrive on Friday, October 12, 2018 so that it will not sit in a warehouse over the weekend. Packages must contain a packing slip stating the number of boxes shipped and number of items in each box. Please include your company or brand name of the product on the entry form, especially when you have more than one entry in a category. 1. Unflavored Soft Cheese Bulk or Tub-Natural, unflavored cheeses made from goat’s milk. Includes all rindless, unripened goat’s milk cheeses with no added flavors. 2. Unflavored Soft Cheese Molded or Formed-Natural, unflavored cheeses made from goat’s milk. Includes all rindless, unripened goat’s milk cheeses with no added flavors. 3. Flavored Soft Cheese Bulk or Tub- Natural cheeses made from goat’s milk and flavored with added condiments, smoke or marinade. Includes all rindless, unripened goats’ milk cheeses with added flavors. 4. Flavored Soft Cheese Molded or Formed- Natural cheeses made from goat’s milk and flavored with added condiments, smoke or marinade. Includes all rindless, unripened goats’ milk cheeses with added flavors. 5. Unflavored Surface Penicillium Candidum Mold Ripened Cheese – Natural surface mold ripened cheeses, made from goat’s milk. 6. Unflavored Surface all other (i.e. geotrichum, etc) Mold Ripened Cheese – Natural surface mold ripened cheeses, made from goat’s milk. 7. Flavored Surface Penicillium Candidum Mold Ripened Cheese – Natural surface mold ripened cheeses, ash coated or layered cheeses, with additional flavoring(s), made from goat’s milk. 8. Flavored Surface all other (i.e. geotrichum, etc) Mold Ripened Cheese – Natural surface mold ripened cheeses, ash coated layered cheeses, with additional flavoring(s), made from goat’s milk. 9. Blue Veined Cheese exterior molding – Natural, unflavored goat’s milk cheeses veined with blue molds and ripened to develop surface mold. 11. Unflavored Blue Veined Cheese (rindless) – Natural, unflavored goat’s milk cheeses veined with blue molds and no surface mold development. 12. Flavored Blue Veined Cheese (rindless) – Natural, flavored goat’s milk cheeses veined with blue molds and no surface mold development flavored with added condiments, smoke or marinade. 13. Unflavored Fresh Mozzarella Cheese. 14. Flavored Fresh Mozzarella Cheese. 17. Unflavored Pasta Filata type – Other than fresh unflavored Mozzarella. 18.Flavored Pasta Filata type – Other than flavored fresh Mozzarella. 20. Flavored Washed Rind Cheese. 21. Unflavored Semi-Soft Cheese – Natural, unflavored cheeses made from goat’s milk containing 40% or higher moisture, other than cheeses included in categories 1, 3, 5, 7, 9, 11, 13, 15. 22. Flavored Semi-Soft Cheese – Natural cheeses made from goat’s milk containing 40% or higher moisture flavored with added condiments, smoke or marinade other than cheeses included in categories 2, 4, 6, 10, 12, 14, 16. 23. Unflavored Hard Cheese – Natural, unflavored cheeses containing less than 39% moisture made from goat’s milk. 24. Flavored Hard Cheese – Natural, unflavored cheeses containing less than 39% moisture made from goat’s milk flavored with added condiments, smoke or marinade. 30. Unflavored fermented milk – Other than yogurt. 31. Flavored fermented milk – Other than yogurt. 33. Gift Basket – These baskets will be up for auction at the Products Reception proceeds from this auction benefit the ADGA Youth Convention. Sorry no amateur entries.